In this visionary book, written by six internationally recognized Global Teacher Prize finalists, the authors create a positive and hope-filled template for the future of education. They address the hard moral, ethical and pedagogical questions facing education today so that progress can serve society, rather than destroying it from within our classrooms. This blueprint for education finally brings forward what has always been missing in education reform: a strong collective narrative with authentic examples from teachers on the front line. It is a holistic, personalized approach to education that harnesses the disruptions of the Fourth Industrial Revolution to better shape the future for the next generation, and ensure that every child can benefit from the ongoing transformations. "The Global Teacher Prize is a one million dollar prize that is awarded to one exceptional teacher who has made an outstanding contribution to the profession. It was set up to shine a spotlight on the profession in order to celebrate the important role teacher’s play in society. By unearthing thousands of stories of heroes that have transformed young people’s lives, the prize brings to life the exceptional work of millions of teachers all over the world. In this book, some of our leading finalists give us their unique insights into how we can teach the next generation to flourish in a world that will be revolutionized by artificial intelligence, automation and new communication technologies. If we are to recognize the contribution of the world's teachers, we must seize every possible opportunity to give them a voice. Teachers point and guide the way, opening young people's hearts and minds, whilst preparing them for the opportunities and threats that the future will bring. Through spreading teachers’ very different stories about how they light the spark of curiosity, we can help give the gift of a good education to every child." Sunny Varkey, Founder of the Varkey Foundation and The Global Teacher Prize, UAE. "The big picture of change – why education matters, what its purpose should be, how this can be done in a rapidly changing world - is usually owned & controlled by academics and policy-makers. Teachers are left with lots of little pictures of things to do and implement in their own classes. From some of the world’s best and most recognized classroom teachers, this book shows how and why teachers must also understand and own the big pictures of change about social justice, peace, democracy, innovation and sustainability – and make these things come true in every class with every child. This is a truly uplifting book by great teachers who are also public intellectuals." Andy Hargreaves, Thomas More Brennan Chair, Lynch School of Education at Boston College, USA. "As our world becomes increasingly complex and divided, our need to foster communities that are healthier, more empathetic, and embrace our shared humanity has never been greater. The authors, among the most highly recognized educators in the world, give us a path forward to achieve this goal. Combining research with compelling narratives, this book demonstrates how education that is rooted in humanity can help foster a new generation of leaders--leaders who adopt a sense of responsibility to other human beings and can act on our collective power to solve society’s biggest challenges. This is a must read for educators and for anyone who has an interest in creating a better and kinder future." Daniel Lubetzky, CEO and Founder at KIND and Empatico, Mexico. "This is an unusual education book. It is built around six individual teacher voices from schools around the world asking the same question: Can teachers make a difference to prepare us for the Fourth Industrial Revolution? Read this book to find out how passionate practitioners can have optimistic professional dialogue about what we need to do and how to transform education systems to be good for all our kids." Pasi Sahlberg, author of Finnish Lessons 2.0, Finland. "Those who write about education tend either to celebrate or to castigate the disruptive aspects of technology. In this collection of essays, thoughtful educators reflect on how best to combine the powerful potential of the new technologies with the valuable, indeed irreplaceable qualities of excellent human teachers." Howard Gardner, John H. and Elisabeth A. Hobbs Professor of Cognition and Education at the Harvard Graduate School of Education at Harvard University, USA. "Education is more than the communication of information, it is the impartation of wisdom, birthed by experience, to the next generation. Teaching in the Fourth Industrial Revolution opens a window beyond academics, into real life." Dr. A. R. Bernard, Founder and Senior Pastor, Christian Cultural Center, USA. Juliet Blake, Head of Television & Curator of Special Projects, TED, USA. "This is a moment in time. How do we prepare students for the Fourth Industrial Revolution? 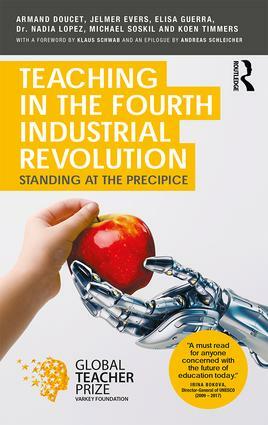 Written by some of the world's most outstanding educators, Teaching in the Fourth Industrial Revolution: Standing at the Precipice is an insightful work on how to help students thrive. An invaluable resource for the world's educators." C. M. Rubin, Founder, The Global Search for Education, USA. "This book makes a compelling contribution to our thinking on education in the decades ahead. The authors – all world-leading teachers – discuss how education can promote a prosperous, just and peaceful future for the world during a time of huge technological upheaval. Through topics such as social media, collaboration across sectors, and the personalization of teaching, the authors also elaborate on their individual pedagogical approaches, drawing on decades’ worth of experimentation in the classroom. The result is an authoritative guide to educational practice over the next three decades." Vikas Pota, Chief Executive, Varkey Foundation, UK. "Are you tired of seeing your students' potential go unrealized and do you feel in your heart of hearts that you could be doing so much more to preserve and protect our imperiled world in a time of unprecedented societal transformations? If so, "Teaching in the Fourth Industrial Revolution" is the book for you! With vivid, hands-on examples, the authors describe how we can work with our students, colleagues, and community partners to uplift education in the years ahead. Best of all, the authors are not afraid to advance big ideas with solid practical foundations beneath them. Here is a book that truly is essential reading for all educators who are serious about paving the way to a better future for all of our students." Dennis Shirley, Professor of Education at the Lynch School of Education at Boston College and Editor-in-Chief of the Journal of Educational Change, USA. "Our planet is struggling to support the methods adopted and the pace of development that we aspire. Many thresholds are close to being breached because of myopic policies and wise decisions are needed to delay and defer the crises. The society needs leaders who can understand the complexities of the processes that are contributing to the problems and those that can counter these. The most critical investment our generation can make, in terms of ideas, time and resources, is in the field of education. This publication has thought provoking essays that stimulate discussion and debate on the problems and potential of education world-wide. There is understandable stress on the need for developing capacity for critical thinking in the course curriculum, delivery methods and assessment of progress from early years. The authors, each a highly recognized teacher and very passionate about nurturing global health, aim at developing empathy at the heart of the education system. This needs to be read by all educationists and policy makers." Er Anuj Sinha, Former Adviser, Department of Science and Technology, Government of India, New Delhi and Chairman, Network of Organisations for Science and Technology Communication, India. "The bedrock of a democratic country is universal; equitable public education. You cannot achieve sustainable economic and social well-being for any country unless all citizens have equal access to affordable education, ideally from two years of age onward. This book explains and demonstrates how to get that educational foundation." "Education and teaching do not conform to a single definition or one set of rules. The world is changing and education must change with it. Perhaps there can be no discussion as important to our children and the world itself, than that of how to prepare future generations to deal with global challenges. The authors share some difficulties teachers face today, but also possible solutions — including bringing the human aspect back to education in a technological and connected world." "New forces are at work in the world: accelerating globalization, technological revolutions, increasing inequalities and global warming. All call for new models of living together as responsible global citizens. This starts with education that makes a difference in the life of every child and youth, whatever their circumstances may be, and empowers them with the confidence, knowledge, ethics and empathy to contribute to their communities and societies. This is the promise of Sustainable Development Goal 4 that aims to 'ensure inclusive and equitable quality education and promote lifelong learning opportunities for all.' This book brings together six wonderful teachers who share one same passion: to make education a truly transformative experience that harnesses technology to connect, but most importantly, empowers teachers and learners through a relationship founded on respect, collaboration and creativity and the conviction that to every learning difficulty, there is a solution. This is a must read for educators, practitioners, decision-makers, parents and anyone concerned with the future of education today." "In Teaching in the Fourth Industrial Revolution six reflective and highly accomplished teachers ponder about the present and the future of the world and of humanity and ask: how could education best serve children so they build a better future? Drawing on years of practice, conversations with colleagues, study of classical texts in education, as well as current education research, they develop insightful and provocative answers to key questions about the present and the future of education. As they pause to ask important questions about what purpose their own teaching practice, and the practice of other teachers around the world, should serve to build a better future, these teachers embody the highest standards of any profession. Their insights have consequential implications for how to structure and support teacher practice and teacher education and lifelong learning.The valuable result of the collaboration of these teachers from four different countries exemplifies also the power of diverse groups to generate creative insights to some of the most thorny challenges of our times. Anyone interested in the future of education should read this book." Fernando M. Reimers, Ford Foundation Professor of the Practice of International Education and Director Global Education Innovation Initiative and International Education Policy Program at the Harvard Graduate School of Education, USA. "The collective voices from effective educators around the world can be finally heard in Teaching in the Fourth Industrial Revolution. The authors, outstanding teachers themselves, reflect on their role as technology enters the classroom. They discuss the challenges of inequity, the perils of education systems that disregard teachers and their insights, and the need for society to step up and claim its place in raising our children. As they stress, human interactions remain at the core of the learning experience; the reader is invited to witness first-person accounts into exceptional teaching practices. This book is the opening line to the discussions we all need to have about education for 2030 and beyond." Emiliana Vegas, Division Chief of Education Inter-American Development Bank, USA. "At a time when the world is facing serious issues, this book makes clear that the solutions begin with education. By blending the perspectives of educators with diverse backgrounds, the authors show how we can improve education systems around the world to create a new era for our planet in which every child is encouraged to believe that anything is possible. Simply put, this book shines a light on how we can prepare our children and our students for the world of 2030 and beyond." Hanan al Hroub, Recipient of the 2016 Global Teacher Prize, Palestine. "There is an old military adage that states: Time spent on reconnaissance is never wasted. Anticipating what lies around the turn in the road has always been a critical matter in any environment. The same is true in Education - only more so. Looking to the future, anticipating issues and suggesting approaches that will bring the next generation to the level of dealing with the critical and complex societal and political issues to be faced, is the challenge. Education is not only the vanguard – it is the solution. This book, by a group of very accomplished teachers and forward thinkers in education, opens the door and lets us have a look at that process. This book is a compelling and authoritative view into that process and that future". James E. Lockyer, c.r./Q.C., Professor Faculty of Law, Université de Moncton, Canada. "Education is the foundation for everything else that we want to achieve and the commitment of the teaching profession is to ensure free public quality education for all children. We need a democratic, professional, self-confident, well-supported and versatile teaching profession that has professional autonomy and professional capital. As these authors - and colleagues- show, it is only by building trust that we will take teaching and education forward. In these uncertain times this book comes at the right time and shows us what can be achieved if we start trusting all our teachers." Fred van Leeuwen, Secretary General, Education International. "The contributors to this book paint a compelling portrait of how we should approach education if we are to provide a sustainable future in a rapidly changing world. The vital lesson to learn from these teachers is the degree to which education must lead the way as governments seek to ensure that society benefits from the Fourth Industrial Revolution." Armand Doucet, Jelmer Evers, Elisa Guerra, Dr. Nadia Lopez, Michael Soskil and Koen Timmers are amongst some of the world's most influential and innovative classroom teachers. As visionary and award-winning educators, they are recognized throughout the globe for their unique and groundbreaking approaches to education. Their ideas are celebrated in a number of different sectors. Looking to purchase Teaching in the Fourth Industrial Revolution in your school? We offer discounts for schools when purchasing in larger volumes. To discuss these options please contact Louise Perrier.